A residential grapefruit tree in the city of Riverside has tested positive for the incurable citrus disease Huanglongbing, or HLB, which causes the citrus greening disease. This is the first case of the disease in Riverside. It has already been detected in LA and Orange Counties. It was found after several Asian citrus psyllids (or the insect that moves the bacteria from tree to tree) trapped in the area tested positive. After the results came back July 25, the tree was removed the following morning. A nearby tree is also being tested and all trees within an 800-meter radius from the infected tree that are susceptible to the disease will be treated to reduce the numbers of Asian citrus psyllids. Infected trees have mottled leaves and fruit that is misshapen the fruit stays green and has a bitter taste. There is no known treatment for the disease and trees usually die within three to five years. Researchers at UC Riverside and in UC ANR are working on biological controls, testing for effective insecticides, developing resistant citrus trees, and finding ways to detect infected trees earlier. Information sheets, videos in English and Spanish, and other resources can be viewed and downloaded here. They can help in identifying the Asian citrus psyllid and the disease symptoms and how you can help in the fight against this devastating disease. If you see any trees that have any symptoms, contact your agriculture commissioner. Information is also available on the state's Dept. of food and agriculture website. If you believe you may have an infected tree, call the California Department of Food and Agriculture at 800-491-1899. Now that two additional backyard citrus trees in Southern California were found to be infected with the bacterium that causes Huanglongbing (HLB) disease, UC Agriculture and Natural Resources (UC ANR) Cooperative Extension advisors and specialists are encouraging all citrus owners to monitor for disease symptoms and report trees suspected to be infected with HLB to the California Department of Food and Agriculture (CDFA) hotline, (800) 491-1899. This month, a lime tree and a kumquat tree with HLB were identified in residential areas of the San Gabriel Valley. 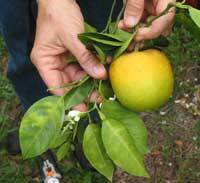 In March 2012, an infected multi-grafted citrus was found in a Hacienda Heights backyard. "So far, the bacterium that causes HLB has been found infecting only three trees, which have all been destroyed," said Beth Grafton-Cardwell, UC ANR Cooperative Extension citrus entomology specialist. "However, it is highly likely there are other infected trees in California. It will be critical for all Californians to assist with efforts to reduce psyllids and detect and remove infected trees to prevent this disease from devastating California citrus." An early symptom of Huanglongbing disease is yellowing of leaves on an individual limb or one sector of the tree's canopy, according to a UC ANR Integrated Pest Management Program Pest Note. Leaves that turn yellow from HLB will show an asymmetrical pattern of blotchy yellowing or mottling of the leaves. The Pest Note includes color pictures and detailed symptom descriptions. HLB disease is spread from tree to tree by Asian citrus psyllid, an invasive insect first identified in California in 2008. ACP has become established in many Southern California communities and is seen occasionally in the state's San Joaquin Valley and Central Coast commercial citrus production areas. Locations where ACP are found are quarantined by CDFA. No untreated or unprocessed citrus fruit and no citrus trees may be moved from these areas. UC ANR maintains an online map that delineates the quarantined locations. The map also shows the area quarantined because of the recent HLB find. Once a tree is infected with the bacterium that causes HLB, there is no cure. To prevent HLB infections, citrus owners in areas where Asian citrus psyllids are found may wish to treat their trees with insecticides. "We believe about 60 percent of Californians have at least one citrus tree in their yard, so HLB could have a devastating effect on the California residential landscape," Grafton-Cardwell said. "There are safe and effective ways to reduce the ACP population, which reduces the chances of losing a tree to HLB." Grafton-Cardwell developed a website for farmers and residents with detailed information on managing Asian citrus psyllid. In some urban areas, a natural enemy of ACP, Tamarixia radiata, has been released. In those areas, Grafton-Cardwell recommends the use of "soft" insecticides that will reduce the number of psyllids and allow the Tamarixia to control the rest. If Tamarixia are not in the area, the website gives information on broad spectrum insecticides to reduce the number of psyllids. The website provides the names of the pesticides, their costs, the duration of control and the effectiveness of the pesticides against ACP. To help California residents and commercial citrus growers deal with the ACP and HLB citrus threats, UC ANR, UC Davis and UC Riverside scientists are conducting research on a number of possible solutions. For example, Abhaya Dandekar, professor in the Department of Plant Sciences at UC Davis, and his colleagues are studying gene fusion, which fuses two immunosuppressive genes that attack HLB in different ways to make the plant more effective at fighting the disease. Mikeal Roose, a professor in the Department of Botany and Plant Sciences at UC Riverside, is working with researchers in Florida to sequence a rootstock that has some natural resistance to HLB and locate the gene or genes that cause HLB resistance. Mark Hoddle, UC ANR Cooperative Extension biocontrol specialist at UC Riverside, has identified a second natural enemy of ACP from the Punjab, Pakistan. (The first one was Tamarixia radiata.) Populations ofDiaphorencyrtus aligarhensis have also been released in urban areas and Hoddle is monitoring the insect's ability to attack ACP. Because it is important to remove trees infected with HLB as soon as possible to reduce spread, UC scientists are also studying ways to identify trees with the disease before visual symptoms occur. For example, Hailing Jin, professor in the Department of Plant Pathology at UC Riverside, has identified small RNAs that are induced by the bacterium that causes HLB and could be used for early diagnosis. Carolyn Slupsky, professor in the Department of Food Science and Technology at UC Davis, has identified metabolites that change in concentration when citrus is infected with the bacterium that causes HLB. She is working with the Citrus Research Board (CRB), CDFA, Texas A&M, and USDA to validate her results and determine how quickly the disease may be detected once the tree has been exposed to the pathogen. She is also part of a USDA collaborative grant to study the vector that transmits the disease to help find ways to stop transmission. Wenbo Ma, professor in the Department of Plant Pathology Microbiology at UC Riverside, has developed antibodies against proteins secreted by the HLB pathogen – revealing whether the plant is infected. These antibodies have been evaluated in California, Florida and Texas for HLB detection. Sacramento, California - The California Department of Food and Agriculture (CDFA) and the United States Department of Agriculture (USDA) have confirmed detection of the citrus disease known as huanglongbing (HLB), or citrus greening. The disease was detected in plant material taken from a kumquat tree in a residential neighborhood in the San Gabriel area of Los Angeles County. This is the second time HLB has been detected in California. The first detection occurred in 2012 in a residential citrus tree in Hacienda Heights, about 15 miles from San Gabriel. Photo by Dr. Susan E. Halbert. HLB is a bacterial disease that attacks the vascular system of plants. It does not pose a threat to humans or animals. The Asian citrus psyllid (ACP) can spread the bacteria as the pest feeds on citrus trees and other plants. Once a tree is infected, there is no cure; it typically declines and dies within a few years. A CDFA crew has removed and disposed of the infected tree and is preparing to conduct treatment of citrus trees for Asian citrus psyllid infestation within 800 meters of the find site. By taking these steps, a critical reservoir of disease and its vectors will be removed, which is essential. An intensive survey of local citrus trees and psyllids is underway to determine if HLB exists anywhere else in the area. Planning has begun for a quarantine of the area to limit the spread of the disease by restricting the movement of citrus trees, citrus plant parts, green waste, and all citrus fruit except what is commercially cleaned and packed. As part of the quarantine, citrus and closely related plants at nurseries in the area will be placed on hold. Residents of quarantine areas are urged not to remove or share citrus fruit, trees, clippings/grafts or related plant material. Citrus fruit may be harvested and consumed on-site. CDFA, in partnership with the USDA, local agricultural commissioners and the citrus industry, continues to pursue a strategy of controlling the spread of Asian citrus psyllids while researchers work to find a cure for the disease. HLB is known to be present in Mexico and in parts of the southern U.S. Florida first detected the pest in 1998 and the disease in 2005, and the two have now been detected in all 30 citrus-producing counties in that state. The University of Florida estimates that the disease causes an average loss of 7,513 jobs per year, and has cost growers $2.994 billion in lost revenue since HLB was first detected in that state in 2006. HLB has also been detected in Georgia, Louisiana, South Carolina and Texas as well as Puerto Rico and the U.S. Virgin Islands. A total of 15 states or territories are under full or partial quarantine due to the detected presence of the Asian citrus psyllid: Alabama, American Samoa, Arizona, California, Florida, Georgia, Guam, Hawaii, Louisiana, Mississippi, Northern Mariana Islands, Puerto Rico, South Carolina, Texas, and the U.S. Virgin Islands.